Don't Worry Douglas by David Melling is the story of Douglas, a bear. Douglas is given a special hat from his father. His dad tells him to take good care of the hat, but Douglas is careless and causes the hat to unravel. His woolly hat turns into a spaghetti hat. While several animals find other uses for the hat, the woolly hat is unusable. Douglas is faced with the problem of telling his dad about the ruined hat. The story ends with a nice twist, and Douglas learns an important lesson about honesty. Our favorite part of the story was the end. Author-illustrator David Melling got quite silly with the uses of many made up hats. And guess what? 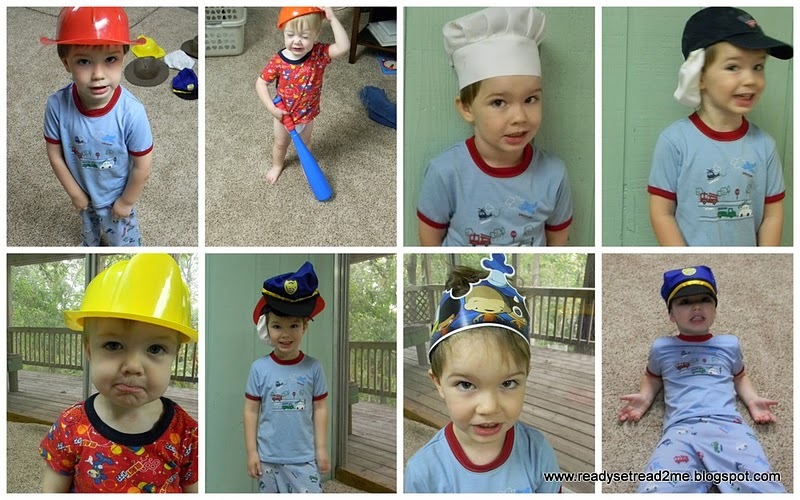 In our preschool boy filled house, the two favorite hats were the diaper hat and the potty hat. Surprise, surprise. This also led to a conversation about the uses of many different types of hats. Following the interest of the boys, we came up with a fun writing extension for this book. We found all of our hats and tried them on. Of course, I had to take pictures of my little cuties. We talked about the uses for the hats as we went and then we played a little game. I would ask a question, and they would pick the hat. What hat would you wear if you were baking a pie? What hat would you wear if you were cold? What hat would you wear if it was raining? What hat would you wear if you were building a house? 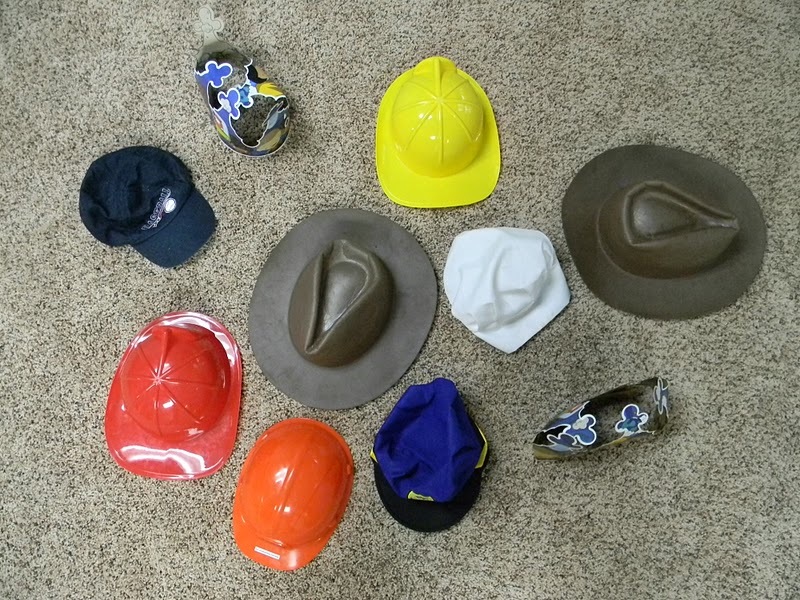 What hat would you wear if you were fighting a fire? I then took their pictures and we created a book that followed this text pattern. We love reading our new book along with Don't Worry, Douglas. Disclaimer: I was sent a free copy of Don't Worry, Douglas! from Tiger Tales in exchange for my honest review of the book. 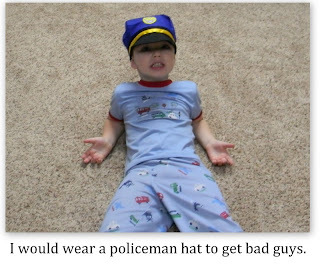 What kid doesn't love trying on different hats? I can see your boys had lots of fun! Oh how creative! Jonathan and Grace love putting on hats-- this would be a great book/activity for them! Hats off to your creative idea! My son would be right with ya on getting the bad guys. 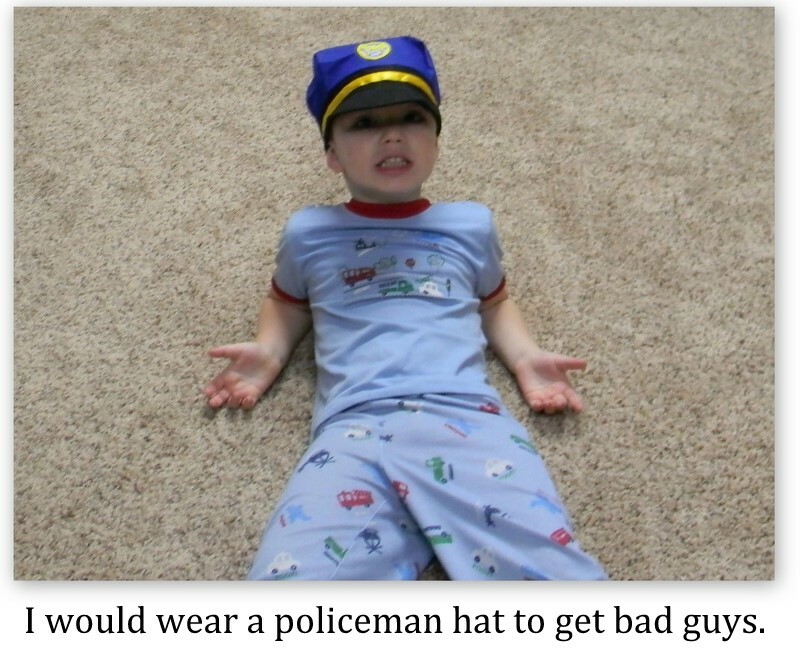 He has that same police hat. LOL! 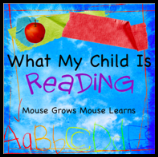 I love your take on this book. What a wonderful variety of hats you have. This is a super cute activity. Very cute idea! And what kid doesn't love putting on different hats :) I've never heard of this book before, but I'll be looking this one up to do this fun activity. Congrats! You're a Versatile Blogger! 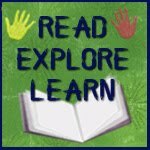 I always look forward to reading your posts about learning adventures with your children. 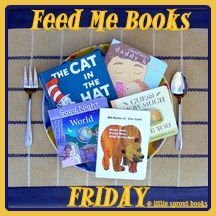 What a great idea to make a book with your kids as main characters! We really liked this Douglas book too. Thanks for joining WMCIR!